The one-of-a-kind robots by Gordon Bennett of Bennett Robot Works are some of my most favorite hand-made robots out there. They are so cool! Looking through the one hundred or so robots on his site, I had a hard time picking which one to post! 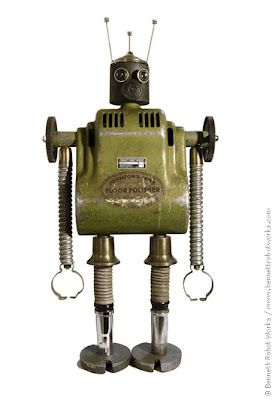 Made from a mixture of new and old found objects, each robot is unique and stands anywhere from 14-37 inches tall. Check these out - they are sure to blow you away!